The amazing apple: versatile, easy to pack, and a favorite staple at my house. 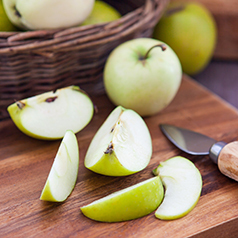 From apple slices with peanut butter to applesauce to chopped apple in yogurt and oatmeal, apples are a fiber-rich sweet crunchy snack not only packed full of Vitamin C but also the less commonly known quercetin. Quercetin is only found in a few foods, including green tea, berries, onions, and apples, and it’s a powerful phytochemical with anti-inflammatory properties. What does this mean for you and your health? The old saying, “An apple a day keeps the doctor away” holds a lot of truth! Try incorporating an apple a day post-workout for quicker recovery (the quercetin and Vitamin C help quench the build-up of free radicals to reduce post-workout muscle soreness) or try these yummy apple breakfast cookies for an energizing on-the-go meal or snack. For oat floor: Blend ¾ oats in blender or food processor. I prefer Granny smith or Honeycrisp and grating the apple so there aren’t chunks in the cookies. Optional mix-ins: Raisins, fresh blueberries, shredded coconut, or chopped nuts or seeds. Preheat oven to 350° F. Spray cookie sheet or line with silicone baking mat (my fav!). Add wet ingredients (apple through honey) and stir until well combined. Add mix-ins of your preference and stir. Place one heaping spoonful (about 1 tablespoon) of dough on cookie sheet.